The Satellite Sentinel Project was launched by George Clooney in October 2010 during a trip to Sudan. 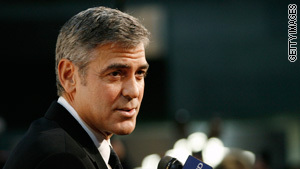 (CNN) -- The government of Sudan may be moving heavy weaponry closer to a disputed oil-rich region of the country, a monitoring group started by Hollywood actor George Clooney claimed. Satellite photos show what appear to be four vehicles capable of carrying multiple-rocket launchers at a camp that also appears to include two dozen light vehicles and tents for an infantry battalion, the Satellite Sentinel Project said. "The deployment of such powerful weapons certainly gives added currency to President (Omar al-)Bashir's order on Friday to his army to 'clear' rebel elements from South Kordofan," said John Prendergast, a campaigner against violence in Sudan who works with Clooney. Prendergast warned that Sudan could be on the verge of another "ethnic cleansing" campaign like the ones "that the regime has pursued in the Nuba Mountains, Darfur, Abyei, and parts of South Sudan." "Given that the Khartoum regime does not distinguish between combatants and civilians, utilizing these multiple-rocket launcher systems would dramatically increase civilian casualties," said Prendergast, co-founder of the Enough Project. President Barack Obama last month urged north and south to agree a cease-fire in South Kordofan, as his United Nations ambassador said Washington was disturbed by events there. "We are deeply concerned about attacks on and threats to and intimidation of U.N. personnel, obstructions to freedom of movement and access for humanitarian goods, allegations and indeed verified reports of aerial bombardment and other attacks against civilian personnel," Susan Rice said. Southern Kordofan is an oil-rich northern border state where fighting has also erupted between government troops and forces loyal to the south as the south prepares to become independent July 9. The border between north and south remains undefined in some areas. The government in Khartoum did not immediately respond to the Enough Project allegations, which were made Friday. The images were taken June 28, the Satellite Sentinel Project. The project, launched by Clooney in October 2010 during a trip to Sudan with Prendergast, involves analysis of commercial satellite imagery of Sudan. It is based on a collaboration between Not On Our Watch, the Enough Project, Google, the United Nations UNITAR Operational Satellite Applications Programme (UNOSAT), DigitalGlobe, the Harvard Humanitarian Initiative, and Trellon, LLC, its website says.